Open from December 4 – February 25, the indoor golf center features a putting green, chipping area and bunker. Two simulators allow golfers to play more than 30 PGA championship courses around the world. The conditioning area is designed just for golfers, and expert staff can help you improve your swing. Call 429-3472 to schedule your indoor tee time! Monday – Friday: 9 a.m. – 1 p.m.
Juniors can learn the game or improve their skills with winter sessions at the DISC! Classes run from early November to early February. Find details here! 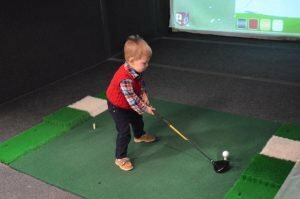 Park District pros offer private golf lessons for players of all skill levels, aged 4 and up. Sessions are held at the courses during the regular season and the DISC over the winter. Fitting services are also available. Call 422-2211 for details. Beautiful Winter Day? Golf at Red Tail Run! The 2018 winter course is Red Tail Run. Golf with us year-round, weather permitting. Book your tee time at 217/422-2211. Check the Golf Decatur Facebook page for weather updates.